As a cider producer, I often feel that I have landed on my feet; been in the right place at the right time. The growth of 146 Cider over the last 5 years has been a little unexpected but very welcome - barring the fact that the one thing holding it back is me (time/effort/funds etc). However, I would argue that slowing things down a bit has been good for me: my cider and its quality is the focus and I truly feel it improves year on year. Then there is blogging cider related stuff - mainly reviews. OK, it put me in a place that I didn't necessarily want to be. I don't like saying something is rubbish (although, quite honestly, some is). The aim was to see if reviewing ciders could bring people to high juice cider by providing enough information in a pleasant way. Only very few have been offended by it, although these have almost 100% been 'fans' rather than the producers themselves (though one or two look and smell like PR/Marketing types). And now, I have had the very good fortune to have got myself in trouble with the NACM (National Association of Cider Makers) by making a trip to Parliament with cider maker and competitive friend Matt Veasey. OK - we took the bollocking, but what came out of that meeting is starting to feel like a 'right place, right time' kind of thing. 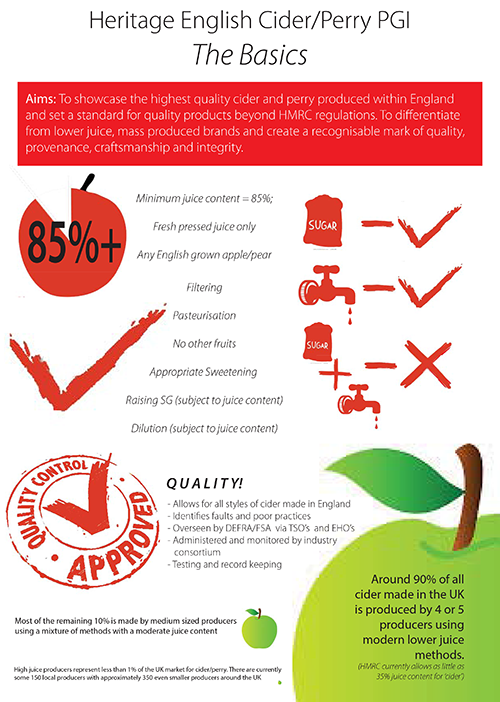 Having built a PGI Group of 50 or 60 UK comercial producers who support the application - and publically presented the PGI plans at Cider Trends Summit I can now publish this and move on with the application in discussion with NACM. One thing that is important to me - and common to all of the things above (except 146 Cider Company) is that they are all now bigger than me or the team who started them. All I can say about Cider Workshop is that I was there at the beginning - it now has a life of its own through its membership. The cider blog - well, cider blogging is no longer a lonely place and to some degree I would be very happy to leave it to the drinkers to take over. And then there is the PGI. This HAS to become a lot bigger than me (although I would rather like to have my name on the application... I suspect its co-authors might too and I certainly wouldn't begrudge that! In a nutshell, PGI (Protected Geographical Indication) is a device used by the EU to declare what makes traditional products and foods unique to an area and attempts to set them apart from other products with less provenance or roots. Generally it is a name that is protected (i.e. only producers making the thing in a particular area in a particular way or using particular ingredients that are able to call it by that name). In the UK, it is governed by DEFRA and the FSA. Getting the content of the PGI right is important. Making the PGI work is important to get right and crucial for it to be effective. Obviously these are only the highlights and there is much more detail in the document - but I think this is sufficient as a lay description. This is an opportunity for the whole English cider industry... no one is excluded as long as they produce a product to the above criteria. The above also demonstrates certain things that are really not that important - and that is in case any of my CAMRA friends read it. 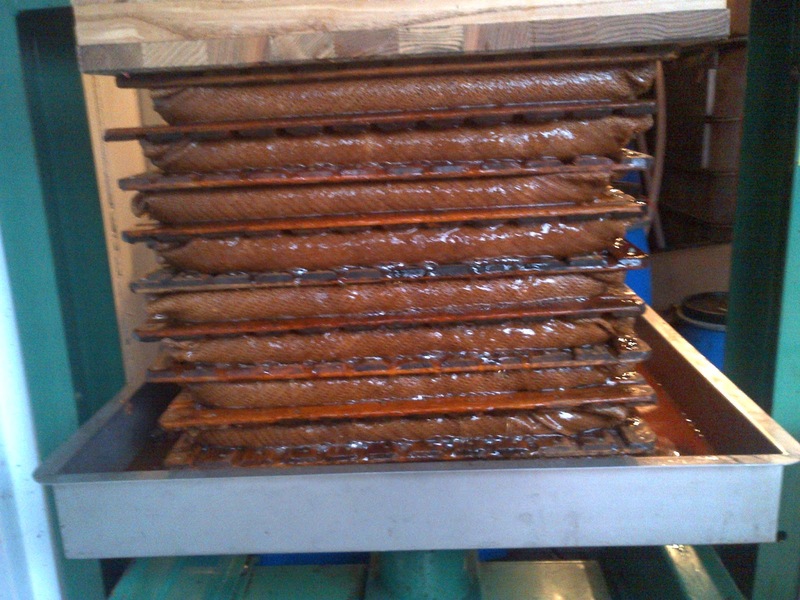 Filtration is useful; pasteurisation is useful; sweetening is useful. Done badly then it would breach the quality criteria. Done well and, well, I doubt you would notice much difference to the quality. The observant may notice that it doesn't distinguish between the styles of cider found in the UK... eastern or western (predominantly). This is because the processes are the same; the quality issues are the same and the heritage of both is equally undisputed - depending on the area of production. Sure, the two drinks are different but only at taste level: an excellent eastern counties style cider is every bit as good as an excellent west country style cider. Only those who would want to use the PGI as some kind of anti competition device (i.e. it must represent the 'terroir' of my farm and the varieties I use and that is it) would object to that... surely?! So, where are we with in now? Well, the application is in the final stages of completion and analyses before it can be submitted. There are some things such as 'juice content declarations' etc. that many in the PGI group would like that need to be looked at before including in the document. 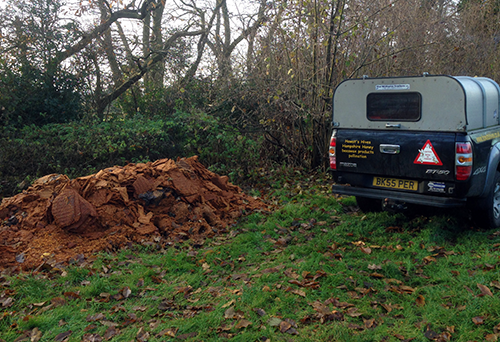 However, the hope currently is that the application will be submitted early in the new year... watch this space!! 2014 Ciders… and a Perry too! 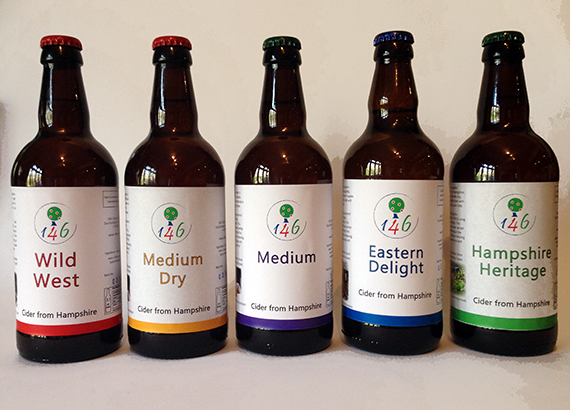 As per usual, May/June sees the release of the 2013 vintage ciders. And so, here is the line up for this year (with some descriptions). The website will be updated shortly! Well, it wouldn’t be 146 Cider without the original cider making an appearance. And, rather helpfully, it has remained at 6.5% for this year. An off-dry cider made from 50/50 cider and dessert varieties of apple sourced locally from Fruitwise Orchards, Heritage is a very easy drinking cider. There is both tannin and acid in equal measure – perhaps a little more acid (once again) as a tiny bit of Bramley was used to beef it up a bit. 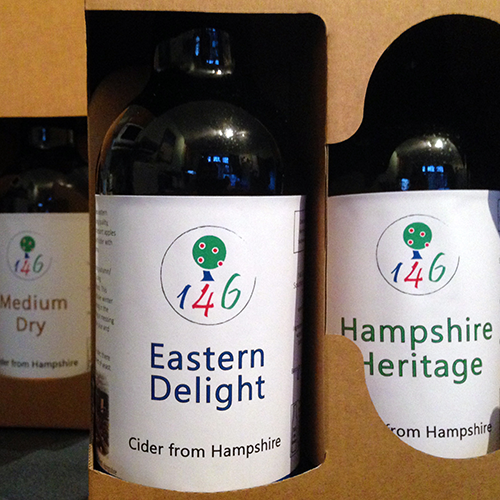 This year, these are sweetened versions of Hampshire Heritage rather than mixtures of blends. Having had plenty of practice now with sweetening, expect these to be on the drier side of things – so that the cider itself actually tastes of something other than sucralose! Made from 100% dessert apple varieties sourced locally from Fruitwise and Hill Farm, Eastern is still quite sharp at the moment. This will calm down, but luckily a few hundred litres have been blended with the much more mature 2012 vintage to tone it down a touch. Sadly, due to lack of varieties last year, there is no Wild West (or, as a result, Mild West) this year. This has been replaced however and given me the chance to play around with blends. You won’t be disappointed!! And this is Wild West’s replacement: a 50/50 blend of Kingston Black and Michelin. A cider with quite a lot of character, the moderate flavour of Michelin allows the Kingston Black charisma to shine through. 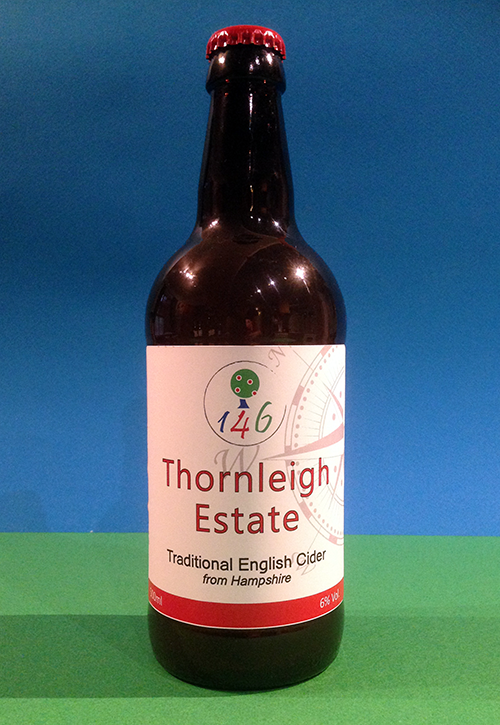 As there is only 1300 litres of it, Thornleigh will only be available as a dry cider in 2014. With only 650 litres produced (it is a trial after all) this is 146 Ciders first perry… and it is really rather good (if I say so myself). A floral perry with a touch of acid, this is made from dessert pears sourced from Hill Farms once disused pear orchard simply called ‘Old Pear’… they don’t know what the varieties are, but I am very glad I tried it! There will be some bottles and it will be available on draught at selected festivals. So, there you have it – the 2014 line up. I hope you enjoy them and do give feedback!! 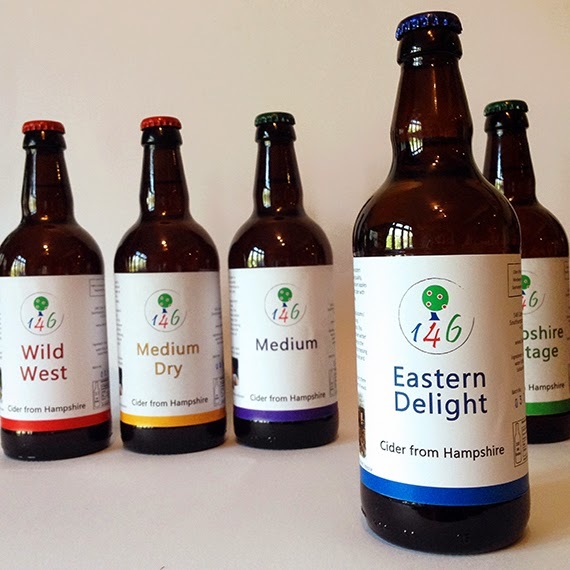 The new 146 Cider website has been launched. Feel free to have a look... its fresher (and better) than the old one. Once you start to travel down the website thingy it becomes a job in its own right to keep things up to date and fresh. I do have some advice about launching a website though (from hard experience). Don't treat it like you would launching a boat. In my case, it was a bottle of traditional method cider. All I can say is that, firstly, bottles are harder than computer screens and, secondly, cider and computer gubbins don't mix as well as I had anticipated! I really love this cider thing. There is always a chance to meet new people and there is always an excuse to have fun. The 2014 Winchester Ale and Cider Festival was just - and working on the bar was a great deal of fun. And because of this, it is even more satisfying that 146 Cider was awarded the Gold Medal, for the second time, for Eastern Delight. And to make things even better, the Medium cider (yeah, its simply called medium) won the Silver Medal... so a 1st and a 2nd for the local cider. I will update with suitably crowing photos of the awards when I get them, but needless to say my head is quite large at the moment:-) And excellent way to start 2014!! 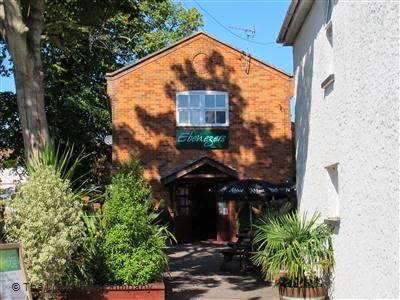 It is also worth letting you know that 146 Cider can now be found in draught at Ebeneezers pub in Hythe... and in bottle form at the Butchers Hook micropub in Bitterne Triangle. I will get them onto the website as soon as I have a second. Last season, I pressed pretty much the same amount of juice as 2012. This wasn't intentional - I wanted to continue to grow the company. However, a few things conspired to ensure that the most sensible thing to do was to stay below the HMRC exemption limit. I am glad I did too if for nothing else but my sanity! So, the good news is that there is Hampshire Heritage for 2014. And, there is about the same amount of Eastern Delight too. There is not going to be any Wild West though. With all the timings and troubles of the previous season (none of which cidery) I couldn't get hold of the varieties I wanted to make Wild West with any kind of similarity to previous years. So I abandoned it for the time being and instead have focused on two varieties: Kingston Black and Michelin. More specifically, a new 50/50 blend of Kingston Black and Michelin. Once I have tasted it I will let you know what it is like, although I am pretty certain it is going to be a very nice indeed. I will post more about the blends and feed additional information through the website (which is slowly being redeveloped). However, this is going to be an interesting year! !